When Lewes-raised newcomer Laucan began singing in falsetto after the break-up of an old band, he had his reasons. “I didn’t want anyone hearing my songs through the door of my room,” recalls Laurence Galpin, the 27-year-old behind the Laucan (pronunciation: Lor-can) moniker. Thankfully, his newfound readiness to be heard doesn’t come at any cost to his distinct voice on his debut EP, Up Tomorrow, released March 6th on Sunday Best. Between its impressionist lyrical images, spectral folk beauty and enveloping soundscapes, Up Tomorrow is a gorgeous, glowing introduction to a singer who found something special in his attic-based isolation. This is richly tended music, made by a man who took the slow, careful route here. 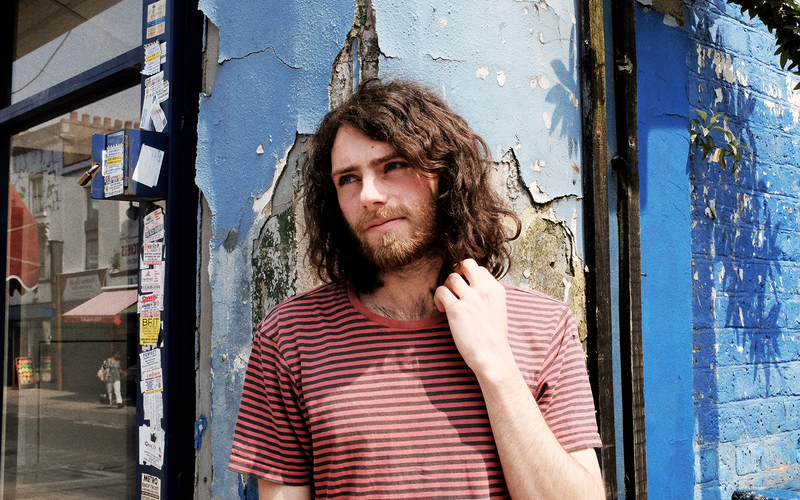 If you hear a British psychedelic folk influence at work, Galpin’s background bears it out. He grew up in Lewes, in the South Downs: “Famed for its Wicker Man-esque bonfire celebrations,” Galpin notes. At 16, he formed a short-lived band that imploded, he recalls, “while stitching together a 40-minute continuous prog/math rock monstrosity”. After moving to London, Galpin felt out of phase with the competitive and fast paced nature of the city, and looked to the past for influence. Submerged in what he calls “folk music of increasing obscurity”, Galpin began writing songs such as “DLMA” (Don’t Love Me Anymore), a track steeped in the kind of anxiety of expression that often haunts artists who refuse to follow trends, preferring to create their own off-piste worlds. “Eventually,” he says, “I decided that either I release them or I just give up writing music.” We’re all the better for the choice Galpin made: his tomorrows are looking up.